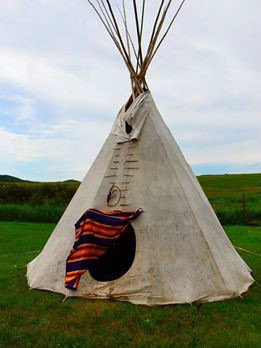 I had the privilege and honor of being asked to do Reiki “in a teepee” on the Wood Mountain Saskatchewan Reservation this summer. While preparing for my first Reiki session, the children followed me to the teepee and asked me what I was doing. I asked them if they knew what meditation was. One of the children quickly sat and posed and said “like this?” I asked them if they would like to meditate with me. They said yes and quickly sat down on the mat in front of me and I led them through a guided meditation. The children were 7 to 11 years of age. After approximately 5 minutes, I told them they could open their eyes and return when they were ready. Another child arrived shortly after and asked us what we were doing. The children said “meditating, do you want to join us?” She quickly sat down and I proceeded to lead them through another guided mediation. After the meditation the children went on their way. Later that afternoon, my Mom told me that the children were under the big top, sitting on tarps and inviting adults to join them in meditation. Wow!!! During my last session, the children came to the teepee. It was a very warm day and the temperature in the teepee was very high and I had opened the flap for some air circulation. My client was in a very deep sleep and I was also very focused and therefore only realized the children were watching from the doorway when they started talking. I smiled and made the sound SHUSH. The children immediately sat down in front of the teepee, closed their eyes and went into the meditation pose they were only taught that morning. I think that next year I will be adding the Meditation Circle for the children….I was humbled….and felt so very blessed to be a part of this adventure. ke to meditate with me. They said yes and quickly sat down on the mat in front of me and I led them through a guided meditation. The children were 7 to 11 years of age. After approximately 5 minutes, I told them they could open their eyes and return when they were ready. Another child arrived and asked what we were doing. The children said meditating do you want to join us? She quickly sat down and I proceeded to lead them through another guided meditation. After the meditation ended the children went on their way. Later that afternoon my Mom told me that the children were under the big top, sitting on tarps and inviting adults to join them in meditation. Wow!!! During my last session, the children came to the teepee. It was a very warm day and the temperature in the tent was very high. I had the flap on the teepee open for some air.